You will seem not coming Vietnam if not have once stopping your feet on Halong Bay. The land of huge nature wonder confirmed by Unesco. The most proud of Halong Bay's sightseeing is the mighty limestone caves range, the endless emerald water, and the wonderful corals reefs hidden itself under the deep pure blue sea. And more than that, is the warm of local lifestyle, always opening hands to welcome friends from far away come to visit. Is the bridge of culture, Huong Hai Junk is as the unique wooden gift from this magic land, always stay and share the most truly feelings of people when they spend time in Halong Bay. Along with the enthusiasm and professional of staffs, every moments of you on The East Sea, will one of most highlights in your life. In the shape of old sailboat, Huong Hai Junk as the picture of last decade's society, through that to recreate a part of Vietnam life on sea years ago. The highlight brown of wooden body vessel make it bright on the middle of legend green color of Halong Bay. Same as a waltz of cultural art, in the first sight, this boat look alike a Vietnam old palace is floating in the Bay. But inside, is the perfectly mixing of oaks and marble, along with the delicate décor details that selective carefully from the ship owner itself. The space is full with the traditional values will bring you into the others feelings, force you live slowly, and let you enjoy more. Huong Hai Junk is seen as the finest choice in the three-star servicing segment in Halong Bay. This boat is available with 5-9 cabins. That most suitable with small groups to Vietnam and the families to looking for a warmed place to relaxing. In all cabins also was equipped with modern amenities system such as: hot and cold air condition, mini bar, shower and toilet…to help you have the most comfortable journey. The sharing room as restaurant, lounge bar or sundeck constructed in line. Let you get easy to find the favorite option as your looking for. Specially, with the extensive knowledge chef team and professional bartender team, you will completely rest assure to put your taste into their hands. More than that, all of fresh ingredients are daily supplied from local farmer and fishing man. In Huong Hai Junk, all your meals are up to your choice. If you’d love local cuisine, you can join in the cooking class that leading by local chef himself. After class, a small party to share the results will bring everyone get closer. The garden of sun in the deck of boat with the soft lying chairs. It's always waiting you come and enjoy the pure air and spectacular view in Halong Bay. The time will fly away when you absolutely deep yourself in this overwhelmed space. In the sunset, when the sun is lower away to the west of sky, the warmed orange color covering over the place, the magic of this land really began. The joyful time will continue with the famous entertaining activities here. Such as: Kayaking, swimming, diving and visiting the unique limestone caves range … that time will start when the boat stop at Bai Tu Long Bay – the most peaceful and beautiful of Halong. For someone who’d love to experience more than that, you can follow our tour guide to take the trip passing cross the markets, the floating fishing villages and local farms to explore the Halong Bay lifestyle. The life that is simple but happiest in the world. Welcoming you back into the boat, let spend a little time on gift corner. Maybe you will see some interesting things. It's suitable to give your friends or family. Make sure you are lucid enough, because the local cute gifts will seduce your small heart, make you deep into and forget your schedule. All the safe facilities are set in your reaching. The life jackets, fire extinguisher and smoke detectors… are newest products, and full for everyone in boat. The professional technician team will strictly follow in 24/24 hours of day, anytime you need them. Just only a call, you will be received the consultant instantly. At the first step you put into the boat, you just have one thing to worry about, that is. How to keep healthy enough to enjoy Halong Bay. 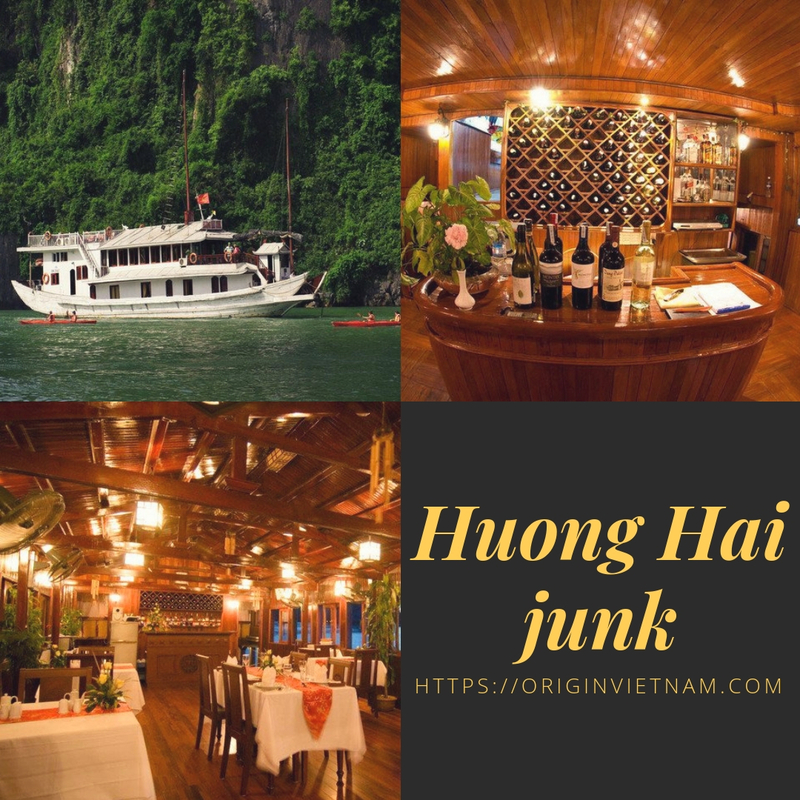 With all the love and pleasure from our old customer, Huong Hai Junk became one of the best choice of experiencing Halong Bay on TripAdvisor and other trusted famous travel apps. That will more quality in the future with nonstop efforts from great teams of Huong Hai Junk. If you want to get more information about the other budget cruise in Halong Bay. Origin Vietnam with the best professional service - that was confirmed by tourists over the world-will the right place spend to you. Keeping contact with us at https://originvietnam.com or Hotline: 8482 909 8686. Origin Vietnam welcomes you!